This time of year is notorious for black and orange EVERYTHING. And as much as we love color association, it can get really old really fast. 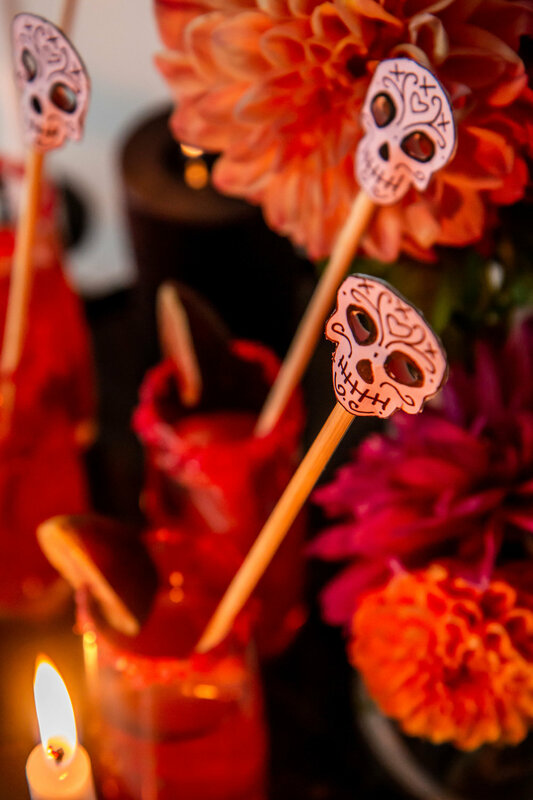 When we decided to throw a Halloween cocktail party at the office, we figured it was the perfect excuse to mix it up. We included black and orange in the mix, but we focused heavily on pink and metallics for a fun, girly spin. We used our favorite Halloween motif, skulls, as our starting point, and built around that. 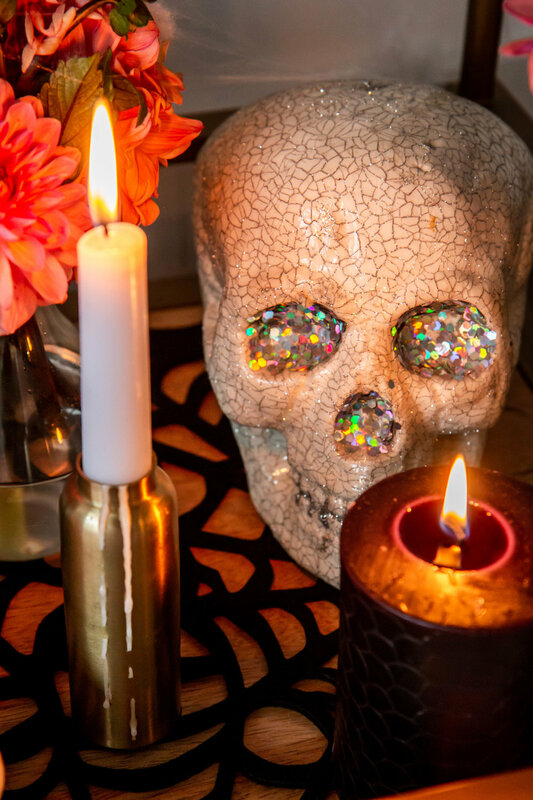 We have some amazing skully decor, including this black skull which we raised onto a white cake stand, a white a silver glillter skull, and a glass skull which we filled with glitter and flowers. Then rest of the skull-themed decor we made ourselves! 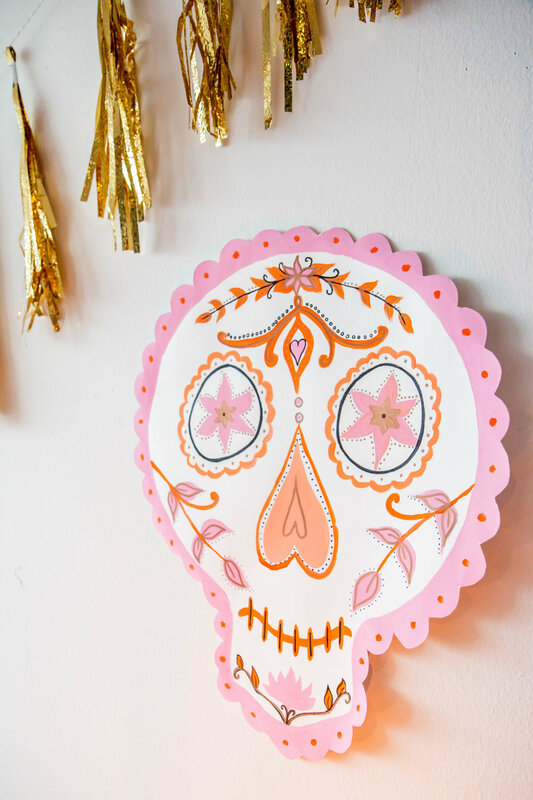 We used makeup on our faces for our own version of a sugar skull, made DIY Sugar Skull Skewers, created a candy bowl sign using dry erase marker on glass over a gold-printed skull paper, and painted a sugar skull for our wall. As usual, we made sure to focus on our signature cocktail as well. We made a fall grapefruit rosé sangria, garnished with crystalized sprinkles and a sliced fig. We served them up in our very own Party People Champagne Flutes, which are shatter-free and dishwasher safe! So perfect for any party. Candles were the perfect addition to make this setup look extra spooky. 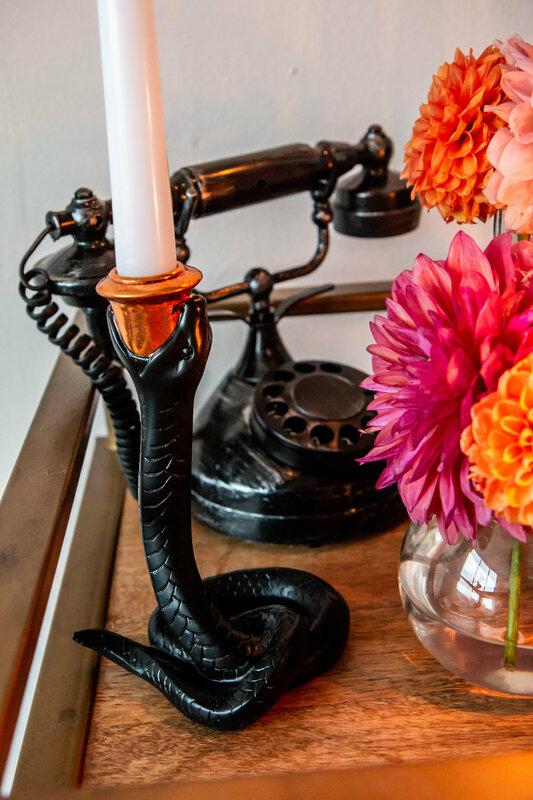 We found these amazing snake holders as well as python textured candles that we scattered around the bar cart. 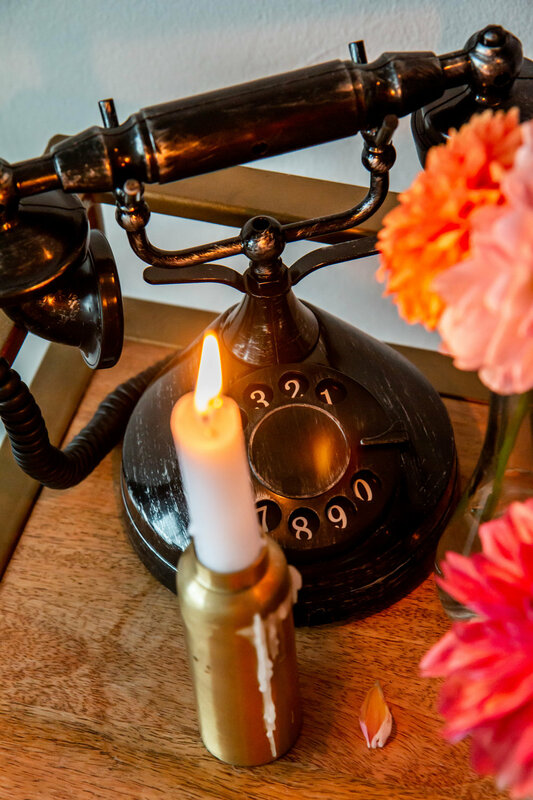 We also love this old school telephone as a prop because it reminds us of old scary movies. Finally, we included our favorite striped balloons, which you can find in our Halloween Party in a Box! Be sure to head over to our shop to purchase soon before they sell out. Last but not least, we strung up gold tassels (learn how to make your own!) and arranged dahlias in various bud vases and a large pitcher. 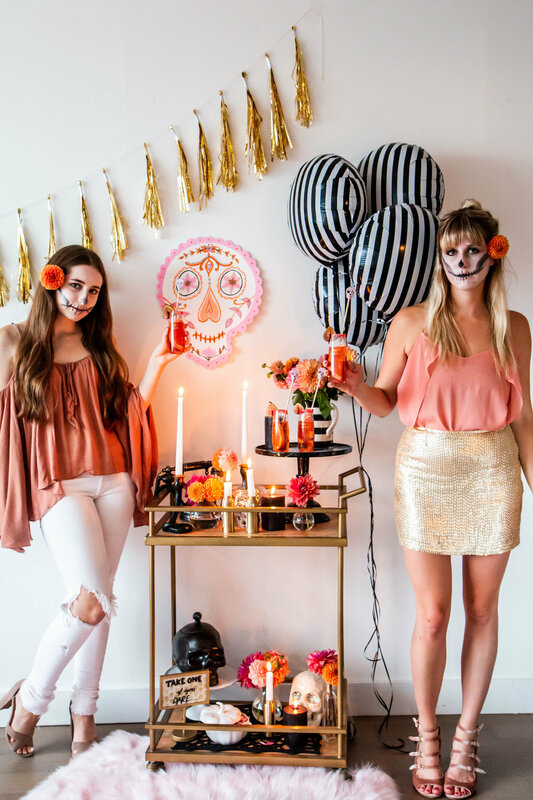 And voila, a Halloween Cocktail party with the pop of PINK that we always love so much. Happy Halloween!